My husband likes to eat healthy. He makes that choice very easily everyday, he doesn't have to think about it at all. I, on the other hand, struggle between what I want to eat and what I think I should eat. I know, I have food issues. But this isn't about me today. Gary's an avid reader of the morning newspaper. When he first read about omega-3 nutrition, he talked about the health benefits of eating salmon to our son Rick's friends when they were in high school. I'd even hear an occasional, "Tell Gary I'm eating salmon" from Rick's friend, Bird. Lately, Gary's been ordering mackerel in Japanese restaurants, so of course, I needed to try making it at home. He says he likes it because it's healthy, it's an oily fish high in omega-3s, and it tastes good. 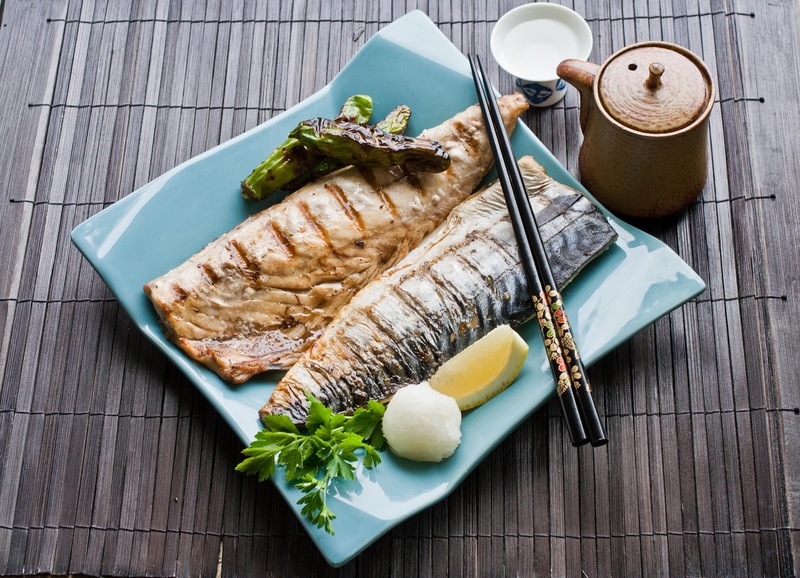 Livestrong has a good article about mackerel nutrition. I bought this mackerel at Nijiya Market and made a marinade of miso, sake and mirin. Mix about a 1/4 cup miso and about 1/3 cup combined sake and mirin for the fish. I went to Marukai the other day, and they had it on sale, already in miso sauce, for a couple of dollars less. 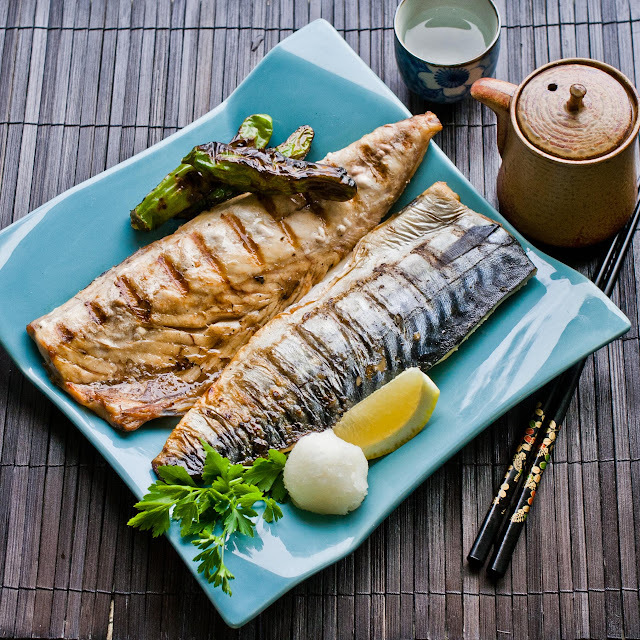 Marinate the mackerel for 24 hours, so the flavor really gets into the fish. The flavor of mackerel is strong. I remember mackerel being a favorite of all the older generation men in my family. Be sure to grill the fish outside on your barbecue so your whole house doesn't smell like fish. Even if it is healthy, oily fish. It doesn't take long to cook, but cook it on low heat so it doesn't burn. Here's Gary on one of our fishing excursions to the barge in Redondo Beach, several years ago. They'd catch a lot of bonito and mackerel there. The barge closed in about 1998, the end of an era. 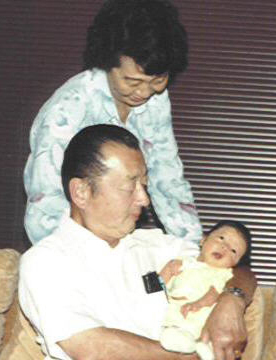 I remember one particular time, going out to the barge with Mr. Miyake, our friend Robert's dad. We'd get up really early and stop at his favorite fishing breakfast spot, Norm's, for a big, hearty breakfast before heading out for a day on the ocean. 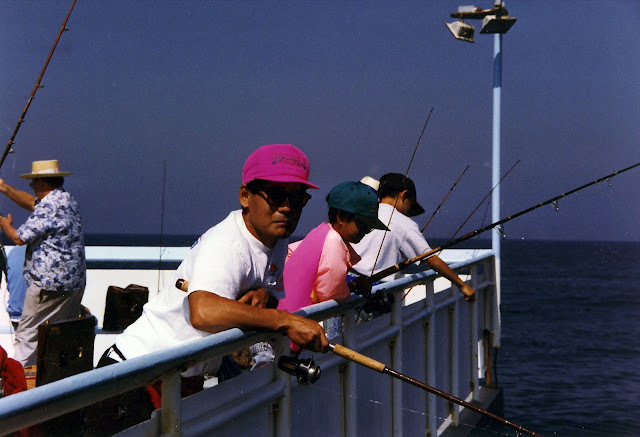 Mr. Miyake knew everything about fishing from the barge. He patiently helped the kids, my son and daughter, his grandson and 2 granddaughters, set up their poles so they could get them in the water before he would start fishing himself. He didn't get irritated when the kids gave up on fishing and played in the bait tank with the live bait. That patience paid off, because when the fish started to bite, the kids knew how to do it themselves, running back to their poles, eager to catch fish. 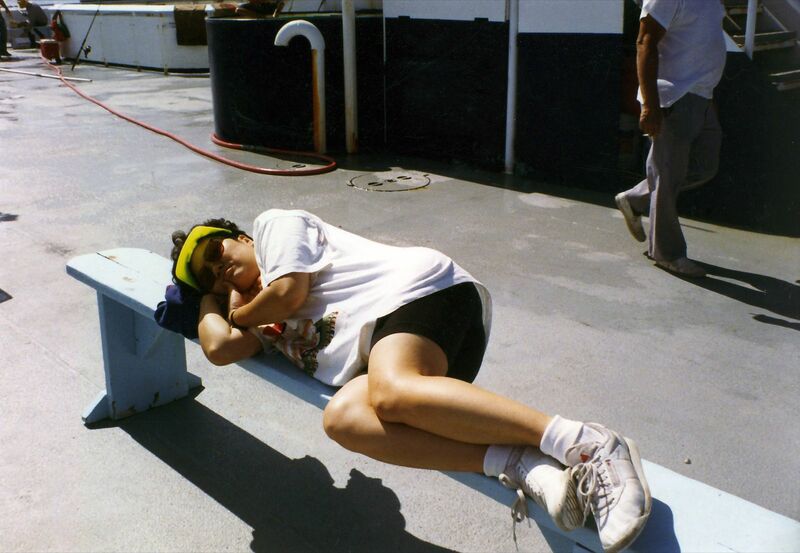 I liked being out on the ocean on the barge. It's a wondrous feeling, being out on the ocean. It's so vast. And you can feel the ocean's power. It's such a memorable feeling, that feeling of being really small in nature. Until your stomach starts to feel queasy with the gentle rocking of the barge. And you lose your hearty breakfast. Seasick on the barge, before catching the next boat back to shore. favorite! i always buy mackerel or other oily fishy delish fishes from the chinese markets near my apartment in brooklyn. sometimes i have to cut out the bloodline depending on what kind of fish i get. otherwise it tastes like bloody, fishy, and bitter yuck. usually do my oily fish shioyaki style because i like the flavor. i'll salt them and stick them in the fridge for about an hour, then just quickly broil for like 5 minutes per side (depending on how thick). and always, always, always eat it with tons of oroshi. if i can find it, i'll sometimes buy shiso or sesame leaves to eat with it as well. i miss the days of the barge when we'd bring home like 20-30 fish each. and even though the spanish mackerel were way smaller and didn't fight as hard, whenever we pulled them in we got way more excited. my grandpa used to pickle them and they were my favorite. in addition to the norms waitress, i'll never forget that bargehand who grabbed the shark by the tail and THWHACKED it onto the barge deck to knock it out. and all of our jaws dropped like..."whoaaaaaa"
wait a sec...is that sake next to the finished saba? that's how i roll too! That fish recipe looks beautiful...I wish I could catch my own fish...where I live it's hard to find good places for it! I love your photos. The stories and recipe are wonderful too!